One of the first people to get the camera is Peter Carsten an early backer and he has started to post some footage tests of birds in flight with the camera. Peter was kind enough to share his footage and even a sample frame for us to test in our RAW DNG Converter. The way the fps1000 works is by recording RAW image data to flash memory and then saving it to a file format. In this case it is DNG which is an open RAW format from Adobe Labs. By using DNG the files are widely compatible with all RAW converters that can handle DNG which means easy tweaking in just about any application from Adobe Light Room, Apple Aperture or DXO just to give a few examples. Peter has posted a few samples at his Youtube channel here! We highly recommend that you Subscribe in order to keep up with his camera samples and testing. The samples are shot with the included lens which is a 35 mm C mount lens and or with a Canon 24 to 70 mm at the 70mm end according to Peter. Probably using a C Mount to EF adapter we believe. We show two of the samples here which show the 500fps camera in action. You can see the rest here if needed. In the Sample below you will see that the image straight from the DNG file has a greenish tint. We color corrected as best as we could to bring out more natural color. The camera can only improve from here by having better color science and or a grey or white balance routine to calibrate the color table. There could also be a LUT library made to color correct the output directly. 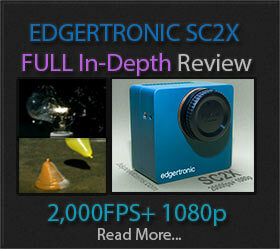 It is clear that the camera is sharp and does offer true 720p HD resolution at 500fps. This was one of the main points to address around the early image samples; that of softness and the DNG implementation retains the detail that the sensor outputs. This is a very welcome development which means that the fps1000 platform is delivering on the promise of resolution right off the bat. Color science should improve or at the very least, calibration of color space should be in the cards for a future firmware upgrade. You will also notice that there is some motion blur on the video images which means the shutter speed was not high enough to offset the motion of the subjects. This can be easily corrected by increasing the setting before shooting. a shutter speed of 1/2000 on a 500fps camera should yield very good and sharp results. Congratulations for Graham Rowan creator of the fps1000 on shipping the first Platinum units and achieving the resolution spec, this bodes well for backers of the Kickstarter project and of higher end performing models. Looks like the fps1000 brand is now a hard reality and this should improve your high speed options going forward. If you are interested in an fps1000 camera and or the project you can visit the official page here! Many thanks to Peter Carsten for sharing his first imagery with the camera with us. Danke Schoën! 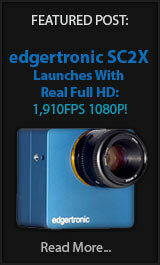 Previous PostPanavision DXL Makes 8k 75fps possible!Next PostEdgertronic Updates Software to v2.1.7! It’s sharp, but there is noticeable aliasing on the bird cage. My RX100 IV in 480 fps Quality Mode using a Caprock anti-moire filter yields a bit better clarity. Still good improvements though. What do you think? 720p sensors have inherent aliasing which is not uncommon. It will be a matter of checking different lenses for the effect based on sharpness. Color moire is well controlled. We’ll check first hand when we receive our 4k model. Furthermore a low pass filter could be added easily for lowering aliasing. What is the fastest shutter speed available? The time between frames at 500 fps is 2 milliseconds. A 1/2000 sec shutter speed equals 0.5 milliseconds. The motion blur at 500 fps with a shutter speed of 1/2000 sec will be 0.5/2 = 25%. That is, 25% of the distance a point source or object edge moves between frames will be motion blur. That much motion blur would affect some applications such as sports motion analysis where single frames are viewed. The spatial resolution for high speed objects will be limited by the motion blur. For applications where videos are intended for entertaining playback and not single frame analysis considerable motion blur is often viewed as a positive characteristic making the video playback more attractive. We still have no confirmation of shutter speed selection parameters but it can probably go very high much higher than 1/2000. Hi, do you have Graham Rowan contact? E-mail? phone? Hey guys. We have an fps1000 Platinum and would like to collaborate with you and answer any questions you have. Just shoot me a message. Hi Paul, thanks for the offer, we are dueback in 8 days from a trip, in the meantime you could post in fps1000 forums or comment on the latest article about it. People are interested in the 8nterface along with maximum selectable shutter speed and ISO. Congratulations on getting an fps1000! Shutter speed is not independently set as far as I can tell. It is automatically chosen depending on the lighting / fps. Iso are 100 / 200 / 400. Personally up to 200 is usable, get’s grainy at 400. Interesting, shutter speed is a very important part of capturing high speed. Hope this gets sorted out. Thanks for the info! Do you have any videos that you’ve made with the fps1000.. When you have recorded your footage..
What software do you use to make it actually slow motion..
You can use any video editor that can read DNG files or even Photoshop CC and make a sequence out of them. The footage is saved as a RAW numbered image sequence in DNG format. Also on Windows and Mac there is Free Da Vinci Resolve 12.5 here that lets you do this and much more. We use After Effects for this kind of editing from years of use but Da Vinci is just as good and powerful with very good features. Plus it’s free! Can we get a mono-color image from this camera? And how can I buy? I am in China. theslowmotioncameracompany.com. no longer works. I will forward your message to the developer, we do not sell cameras. Good day!